My mouth starts to water for my mom’s zucchini casserole as soon as we put the first zucchini seeds in the ground. 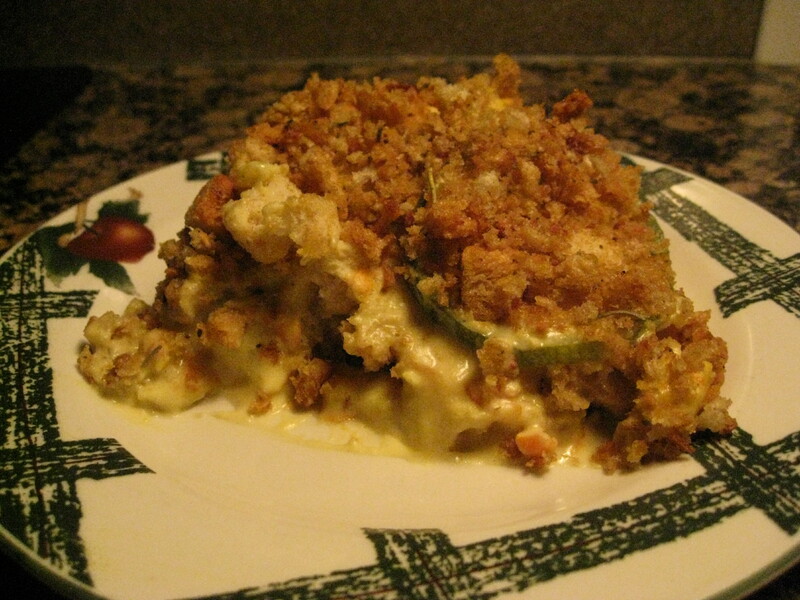 She makes it with loads of cheese and sour cream, then covers it with crunchy seasoned bread crumbs. I had to figure out how to veganize it and I was happily surprised at how well it turned out. My Dad even ate it—twice (he doesn’t know it is vegan). He just told me it was as good as he has ever eaten! Grandma also enjoyed it, but Grandma tells me everything I bring her is the best thing ever. Method: Boil squash, onion and carrots for 5 mins, drain, mix with melted cashew cheese, set aside. Mix melted earth balance, bread crumbs and vegi bullion. 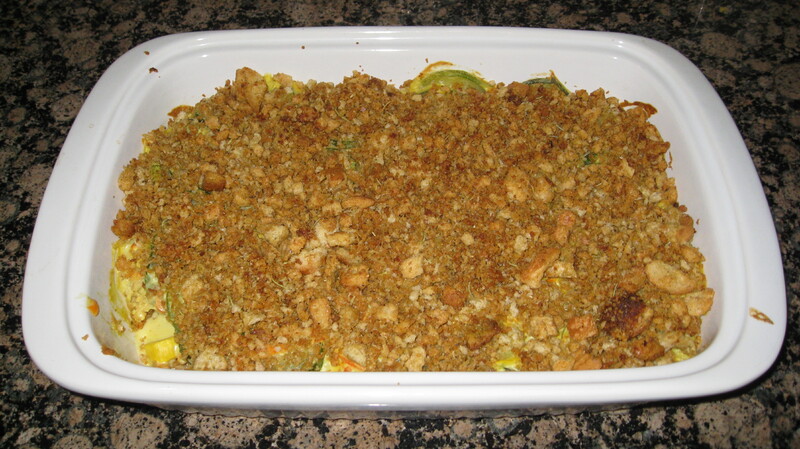 Place ½ bread crumb mixture in 9×13 pan, pour squash mixture over the top, spread remaining bread crumbs across top. Note: if you are only using 5 oz of bread crumbs, don’t put any on the bottom, place the squash mix directly in the pan and then spread bread crumbs over the top. Bake uncovered, 350 for 30 minutes. Even with the casserole I still have squash coming out my ears, so I have been trying to incorporate it into some of my “staple” meals. Mountain West Burrito gave me the idea to put it in my burritos (never would have thought of it). Water sauté onions and squash, add black beans. Warm tortilla in pan, spread guac and salsa, put ½ squash mixture in the middle. 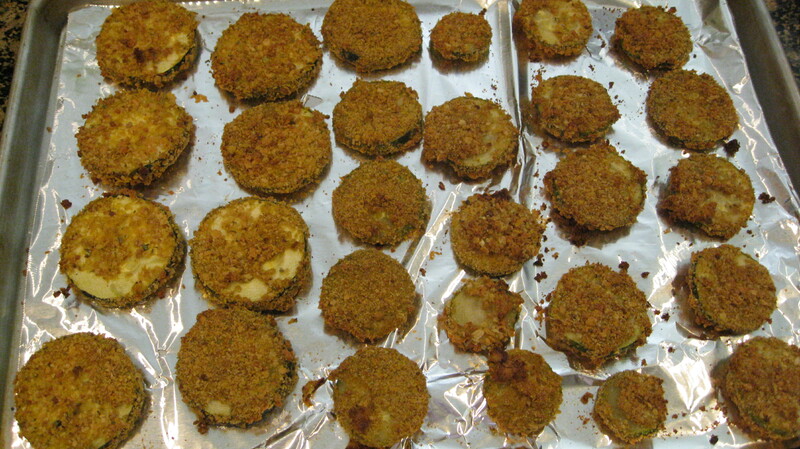 Place coated zucchini slices on a baking sheet (I line mine with non stick foil for easy clean up!) and bake for 30 minutes, flipping (tongs work best) the slices over once halfway through cooking, or until browned and crisp. Nutrition: Stayed within 1400 calorie budget 4 out of 7 days—not stellar, but going to do better this week! Weight: I weigh in with my trainer every Monday night. I weighed in this Monday at 156, so I am .6 lbs down, which is about right considering I only stayed within my calorie budget 4 days of the seven last week. I have been drinking lemon water like there is no tomorrow, cut down on sugar and fat and trying to keep carbs under 100/day—that is kind of hard. But overall I feel good about what I am doing. I am wearing one of my favorite pair of shorts and I can breath! This entry was posted in Casseroles, Chips, Dips & Flips, Wrapped Foods and tagged dinner, food, Low Carb Burrito, Mom's Squash Casserole, Zucchini Chips. Bookmark the permalink. YUM! Now if only I could get my zucchini to grow! I only have summer squash which is hidden between other things so I keep forgetting to harvest it. When i do it’s huge. I can’t wait to try these if I can get my zukes growing! georgous recipes which i all must try! I especially love your zucchini casserole!! i can use up my yellow & green courgettes! Yum! So cool that your dad didn’t even notice the difference! My Dad is a new man! Did he read the book!?! Really?!? Wow. Well, that’s one less battle, but no less scary. I hope they figure it out! his blood pressure is out of control, at stroke levels actually. They have him on new medicine, hopefully it will work. That looks delicious! Zucchini is my favorite vegetable as I use it in A LOT of my dishes! I’m going to have to try this! I love your zucchini recipes!! The casserole looks yummy, great idea! I love it too. We grilled it tonight—Delicious! I am making it again tomorrow. Please let me know how you like it! I want to try that casserole! It looks SO good!